Say the name Tony Hawk in a crowded room and everyone will come up with a memory. Some had their very first virtual adventures playing a Tony Hawk franchise video game for hours at a time after school. Some hopped on a board after seeing the skate legend perform on TV. Some only ever vaguely knew of him and his accomplishments, but know that his name is synonymous with cool. 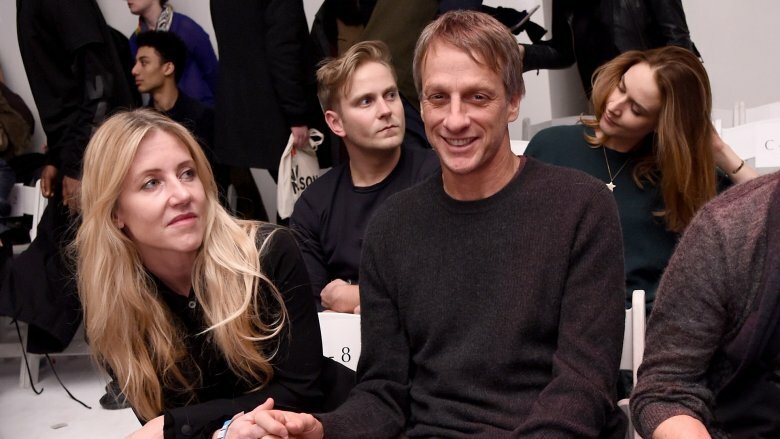 That, at least, is what we all agree on: Tony Hawk is cool, from his legendary prowess as a skater to his confident grin. He shaped a generation's idea of skateboarding as a formidable sport — an art, really — performed in mid-air at extreme speed. And he made it clear that a career could be built on that, spanning genre, medium, and era. 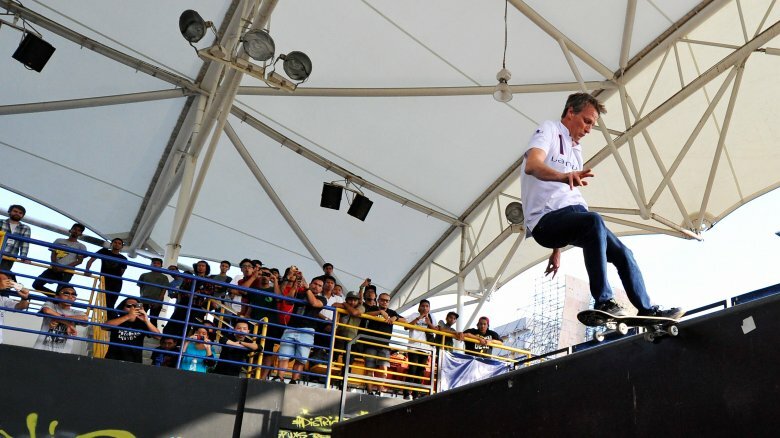 Years after the peak of his visibility, Tony Hawk is still around. At 50, one might think he's slowing down a bit, easing into a quiet retirement perhaps, surrounded by the artifacts of his long and glorious tenure as the world's reigning king of the skatepark. After all, he's a dad with a passel of children and a comfortable California home. But in fact, Hawk is as busy as ever. From fashion to social media, he's exploring new ways of celebrating skate culture and bringing it to the masses with a reach and velocity only possible in the here and now. He might already be an icon, but he's not slowing down anytime soon. 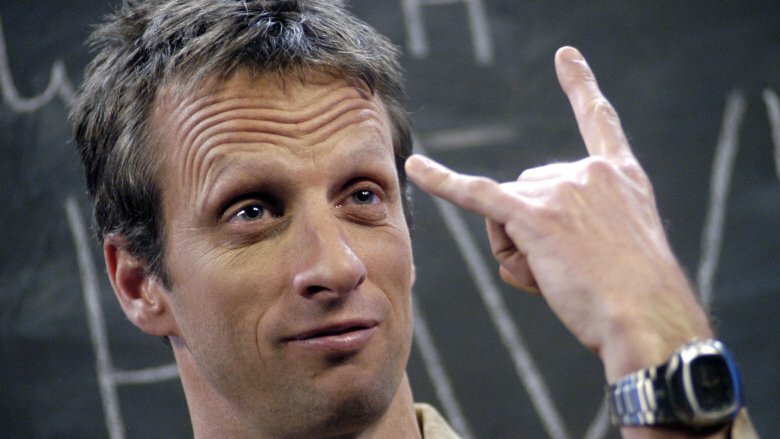 For a huge swath of kids, teenagers, and savvy adults at the dawn of the new millennium, Tony Hawk defined what it meant to be awesome. But today, the man behind the board is as much into his family as he is into the half-pipe. 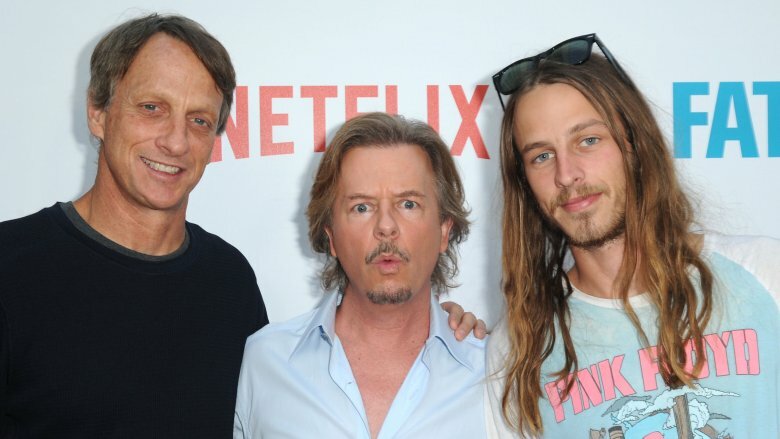 His son Riley Hawk was born of his first marriage in 1992. Two more boys, Spencer and Keegan, were born of his second marriage, and his first daughter, Kadence Clover, was born in 2008. He married once again in 2015 and now lives comfortably in California. Cue the matching duvet sets and the shutting-away of the skate gear forever, right? Not likely. Hawk might have grown older, grayer, and less ubiquitous, but his love of skating pervades his home life. Eldest son Riley has become a celebrated skateboarder in his own right — on his 21st birthday he went pro and won the Best Am award within minutes. Today, he's sponsored by Baker Skateboards and has become respected as a street-style skater, in contrast to his father, one of the most celebrated vert-style skaters of all time. Kadence also pops up regularly on hawk's Twitter and Instagram channels, learning the basics from the world's most accomplished teacher. Though she has been known to drop her board dramatically when frustrated by a particularly tricky maneuver, her talent is already apparent. The Hawks are well into another decade of putting their own spin on the classic maxim: the family that skates together, stays together. It's not all babies and kickflips for Hawk, however. He's a passionate philanthropist as well, and has only thrown himself more and more passionately into charitable work as the years have piled on. In 2002, he created the Tony Hawk Foundation, an organization that facilitates the building of public skateparks across the United States. Focusing specifically on the needs of low-income and otherwise disenfranchised areas, the foundation has, to date, awarded $7.9 million in funds to accomplish this goal. A glance at the nationwide map on the foundation's website reveals the startling breadth of this mission. No part of the country is unmarked in Hawk's quest to make skating accessible, respected, and safe in all communities. Recently, Hawk has spearheaded the campaign to take the foundation global with a $50,000 grant to Skateistan, an organization which works to bring skating to Cambodia, Afghanistan, and South Africa. "Knowing what they've achieved, and seeing what they have planned, I am confident [Skateistan] will bring skateboarding and educational services to even more at-risk youth around the world," Hawk remarked in 2018. "It's an honor to be an avocation of their incredible work." In addition, Hawk helped found Athletes for Hope in 2007, alongside luminaries including Mia Hamm, Andre Agassi, Muhammad Ali, and Cal Ripken Jr. Athletes for Hope works across leagues, universities, and sports to foster workshops, training, and connections between the world of elite sports and young hopefuls without deep pockets. More than ten years later, they're still going strong. Hawk's career coincided with an explosion of innovation experienced by few athletes in history: the rise of the internet and omnipresent media. Suddenly, sports became something happening in front of you, on screens large and small, that you could share with friends across the globe and comment on in real time. Hawk has never shied away from harnessing this sea change — he's likely as famous for his video games as for his actual skating. But it's only recently that he's jumped into the world of original video content, and he's done it head-first. Enter the RIDE channel, Hawk's own little corner of YouTube just about everything that can be connected to skating and skate culture. As he details in the welcome video, he launched it in 2011 and was "super excited… it's something we've always wanted to do and it's finally a reality." RIDE has an absolutely dizzying lineup of programs, from Concrete Dreams (a documentary web-series about the challenges and triumphs of skatepark advocacy produced with funding from the Chicago Digital Media Production Fund) to nitty-gritty reviews of the latest skating gear. RIDE does not shy away from any aspect of skating, from the injuries it incurs to the decidedly un-radical work it takes to make a skatepark happen. And that's what makes it great: it's not about the cool factor, but the reality of the sport. Not a bad launch for a 50-year-old dad. Hawk's swift rise to the top has made him a hot commodity in entertainment for decades. His cameo list runs wide and deep: he's appeared in kiddie fare ranging from Rocket Power to Drake & Josh Go Hollywood and action flicks like Thrashin' and Deck Dogz. Hawk's skater bonafides have always been able to lend a certain authenticity to whatever he's chosen to be a part of because, well, he's not just a mascot but actually one of the greatest living skateboarders. When he shows up in Lords of Dogtown as as astronaut comically wiping out after taking a turn on a skateboard, you laugh for real. Despite the relative paucity of skate-related cartoons and movies compared to the heyday of the early 2000s, Hawk hasn't just kept on popping up in media both unexpected and totally within his wheelhouse — he seems to be having quite a bit more fun with it as well. He pops up on everything from YouTube sensation Epic Meal Time (where he ate a deep-fried pizza cake) to Sesame Street. In many ways, the pressure of branding is off, as he no longer has to establish himself. He's a superstar, an athletic legend, and a mogul across genre, so why not have a bit of fun on The Aquabats! Super Show!? Emojis are as much a part of language as the actual alphabet nowadays. The poop emoji emblazons naughty kids' t-shirts, the eggplant stands in for all manner of things vegetal and otherwise, the OK hand symbol is the lingua franca of sassy teenagers everywhere. They bring the world together across barriers of language and custom — we can all agree that the moon with the face looks weird, that the little sheep is so cute we wish we could work it into conversation more often, and that the sparkles are applicable to basically everything. Emojis matter. When one is just plain wrong, someone needs to fix it. Hawk was just that person when, in 2018, the Unicode Consortium debuted the official skateboard emoji. It had been a long time coming — as had its brethren inductees, from the bagel to the redheads — and it caught Hawk's eye. Sadly, it did so for all the wrong reasons, as he went on to elaborate to Intelligencer: "It basically looks like a skateboard you would buy at a department store in the '80s." From its twin rectangles of grip tape, to its wooden body and the odd concave bend, it truly did look out of date and, frankly, cumbersome to skate on. Happily, as Hawk noted on Instagram, he was invited to adjust the emoji to a more modern design. The high emoji muckity-mucks got in touch, Hawk sent a few pictures of his own board, and voila: the emoji skateboard was saved. For as influential as Tony Hawk the zeitgeist-capturing skateboarder was, just as enormous was Tony Hawk the video game superstar. The Activision series, which ran from 1999 to 2015, spawned 19 games and captured the imagination of a generation. Tony Hawk's Pro Skater in particular ruled the virtual world well into the 2000s, and, nearly two decades later, is cementing its place as a nostalgic touchstone. From the Game Boy Advance to various iterations of the PlayStation, it made millions. Next Generation, a now-defunct British gaming magazine, ranked it as the 14th highest-selling game between January 2000 and July 2006, estimating its total units sold as reaching 10.7 million units in the United States. It was, to put it plainly, a phenomenon. But sales slackened as the years wore on and the quality of the franchise began to dip. 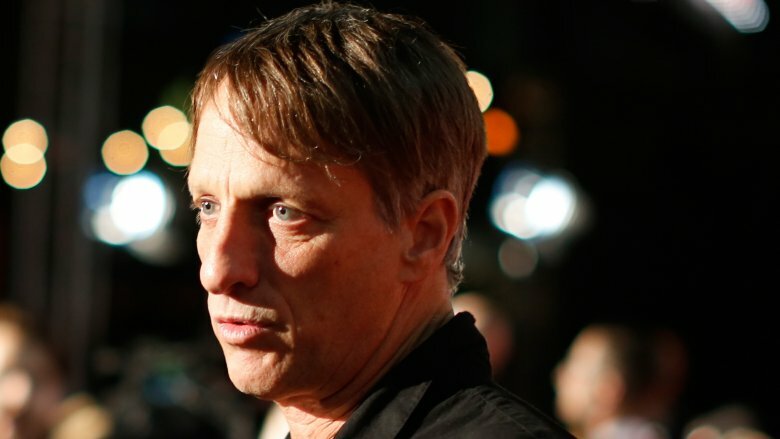 Tony Hawk: Shred, a 2010 release, was only able to garner a few thousand sales and 2015 saw the expiration of Hawk's partnership with Activision. Dire straits indeed, but it would be foolish to count Hawk out of the gaming scene entirely. 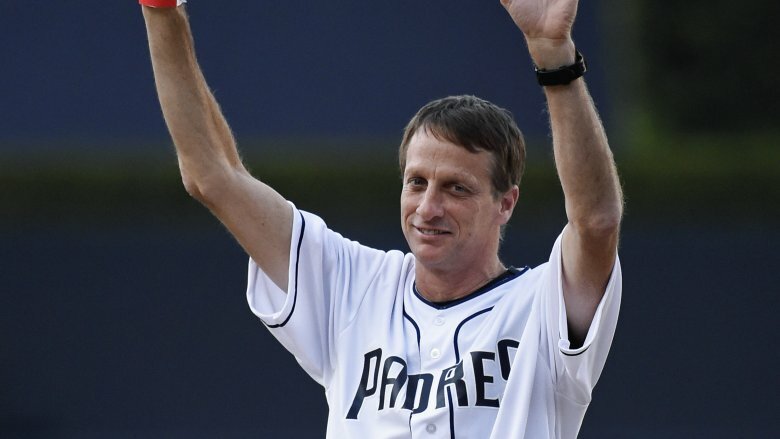 Only a couple of years later in 2017, he was going public with his commitment to the future of the Tony Hawk gaming franchise. 2018 saw the first post-Activision title go live with the mobile-based Tony Hawk's Skate Jam. Moreover, the franchise has a metatextual future: Pretending I'm a Superman: The Tony Hawk Video Game Story crowdfunded roughly $17,000 in 2017, and promises an inside look at the making of the now-iconic series. Hawk himself is involved, and with production wrapped, it's set to be released in 2019. Skateboarding is a multifaceted sport that evolves with the times. What was once impressive becomes passe, what once seemed challenging becomes rote, and styles proliferate as more and more people hop on a board to see what they can do. Witness the Hawk clan unto itself: eldest son Riley does not even attempt to claim he's within his dad's class as a vert skater, but within his own comfort zone has managed to pull off a few things even his intimidating patriarch can't do. One could comfortably stay in skating from birth to death without running out of new things to do within it. But top-tier athletes like Hawk aren't often content letting just one sport fill their days. Enter snowboarding. Though it's easy to see the connection between it and skateboarding — two legs on a board, playing with physics and momentum to pull off jaw-dropping jumps and tricks — quite a bit is different, and it's clear Hawk enjoys the challenge. Witness his Instagram documentation of his time on the slopes: sometimes he's cool, collected Tony Hawk, treating the snow like it's any old skate bowl, and sometimes he and his all-star buddies wipe out at the foot of a pine tree. Snowboarding demands an entirely different environment and relationship to the board, in addition to different tricks and markers of success. And when he's ready for an entirely different challenge, he's been known to indulge in poker, where, he jibes, "I'm really good at poker, and calling bluffs. Or maybe I'm just bold and lucky." Perhaps the greatest pastime of the social media age is browsing through one's various feeds, timelines, dashboards, and lists, catching up on the day's idle news and commenting with friends. Hawk's no stranger to this — no one really is these days — but given his notoriety, he gets to have a whole different level of fun with it. The ten-year challenge, in which one juxtaposes a picture of themselves a decade ago with a recent one, takes on a whole new level of meaning when you can, as Hawk does, hold up a copy of the bestselling video game that bears your image. Showing off something cool has extra dimensions when your career spans decades and you've decided to take an old trick out of mothballs. While social media is often depicted as frivolous, time-wasting, and inane, Hawk makes the best parts of this hyper-connected age we live in apparent with his use of Twitter, Facebook, and Instagram. They're all ways of connecting with people past and present over where we've been, what we've done, and what we're up to now. Granted, not all of us are posting gravity-defying stunts pulled off in our private skateparks to our accounts, but the sentiment holds. It'd be easy to reach Hawk's age, especially as someone famous for physically challenging feats, and become more than a little blue about the passage of time. But rather than focus on what's passed with a glum sense of loss, Hawk revels in the many facets of his long career now that he has the time to take a breath. This ranges from the unquestioned highs — awesome photos of him pulling off vert insanity in 1984 — to the truly bizarre. Did you know, for example, that Hawk almost got the Space Jam treatment? It's true: 2003 saw Warner Bros. calling Hawk up to discuss an animated project that, sadly, never got off the ground. How about the time he appeared on The Simpsons, though? Or the tube socks he used to wear while learning to skate in 1978? Or, roughly three decades later, when he impressed a whole new crop of kids by showing up on skate-centric cartoon Rocket Power? Hawk's time in the spotlight has contained so much that, at 50 years old, he has an absolute plethora of experiences to reflect upon, and a whole bunch of ways to share those reflections with his fans. Luckily for all of us, he does — and often. Skate culture has been influencing fashion for a long time. For decades now, cultivating a just-off-the-half-pipe look has been an identifiable sartorial choice, even if the person sporting it doesn't know an ollie from a kickflip. Wallet chains, chunky sneakers, durable fabrics, graffiti iconography and more have contributed to this style subculture over the years — recall Avril Lavigne's smirking roll-through of suburbia from the early 2000s, or the unkillable momentum of Vans Off The Wall. Skate culture is hip and doesn't seem to be going anywhere. So really, it was only a matter of time before an actual skater went ahead and made the relationship official. Hawk has done just this with the Tony Hawk Signature Line, a collection he debuted at Paris Men's Fashion Week. A mix of old and new fashion including work pants, slouchy flannels, and neon-hued prints, the line is an upscale take on what has long been mined by the denizens of the runway, but never represented by one of their own. In discussion with Vogue, Hawk reflects on the success of streetwear brands like Supreme and Palace, and the indication of a wider cultural shift he seeks to be a part of. "They've never really changed their direction. But now it's become recognized and embraced by a much bigger crowd," he explained. "People who want to have that look but who don't necessarily skate." Though the styles have changed massively over the years, the fundamentally challenging nature of skate culture remains attractive, and he's eager to see what might be made of a collaboration with the world of high fashion. So, of course, is his eager public.